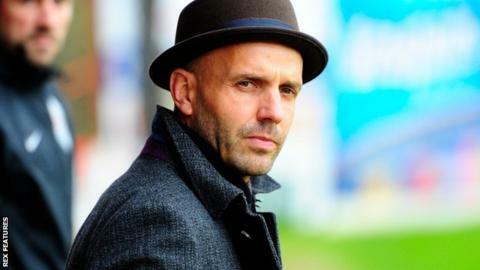 Exeter City manager Paul Tisdale hopes his players will not be distracted by the club's FA Cup third-round tie home tie with Premier League side Liverpool. The game on Friday, 8 January will be televised live by the BBC. It will be Exeter's first third-round appearance since taking Manchester United to a replay in 2005. "It would be ridiculous if this tie cost us the next two or three games because we're not focused," Tisdale, 42, told BBC Sport. "The players have got to work just as hard and motivate themselves in whatever way they can, as they always do, to train hard every single day." But Tisdale says it is rare that his side has a focus so far into the future, adding: "Normally you're looking maybe one or two games ahead for a player. "They have that focus now on the horizon which is six games away. It's the unusual nature of a long-term focus beyond the next couple of games. "I'm certainly not going to mention it every day to them because they'll get sick of me, but I think we all know that they want to do their best to have a chance of being selected."